My darling dotzy turned five last weekend and we had an amazing party at the park. Among the fun and frolic was great food including snacks made at home. I made Blueberry Vanilla Cupcakes, Chocolate cupcakes, pinwheel cookies, Nipattu and Pakoda all of which were well recieved and the boxes were nearly empty by the time we came back home. Its always very gratifying to have super success with your food! Pinwheel cookies was part of the Home Bakers Challenge for June, a group which I have joined on FB. I had already made the Peanut Butter Cookies and now found the perfect opportunity to bake cookies in a house where the folks dont eat anything sweet! One thing I must say about these cookies - they taste best till the next day once done. They get a cardboard-y taste after 2 days. So eating them fresh is the way to go according to me. This recipe has been adapted from The Heritage Cook and adapted to make it eggless. It requires making two varieties of dough, one chocolate and one vanilla, and rolling it together. 1) The easiest way to handle this dough is to keep it cold. I refridgerated the dough quite a few times to be able to make it easily. After I kneaded it wrapped in cling wrap and also after I rolled it out and wedged between parchment paper, for 30 mins each time. 2) Flatten the dough in between layers of parchment paper to make it easier to roll out. Else it sticks to the rolling pin. Also cleaning up becomes a breeze! 3) It might be easier to press down on the dough with a heavy wooden spoon or rolling pin and push it outwards to flatten it rather than rolling on it using a pin. 5) Refridgerate dough log for atleast an hour before cutting it into cookies. This ensures the dough log is stiff and cutting it into cookie rounds makes it easier without the dough losing shape. 6) Last but not the least, dont get intimated by the length of the instructions. Its easier done than explained. In a mixing bowl beat the butter and sugar until light and fluffy. Beat in the egg replacer and vanilla extract and beat again until blended. Refrigerate one part wrapped in cling wrap for 30 mins. That will be the vanilla dough. Melt the chocolate chips along with the milk in a microwave by heating it for 10 secs. Set aside to cool. Add the cocoa and the cooled melted chocolate to the second half of the dough and mix till well incorporated. Refrigerate this chocolate dough wrapped in cling wrap for 30 mins. Place the vanilla dough in between parchment sheets measuring 12 inches * 12 inches. Flatten the dough in between the sheets to the dimension of the paper. Optionally refrigerate the two dough discs along with the parchment paper for 30 mins. This step is necessary if the weather is really hot and humid. Set the vanilla disc on a counter and peel away the top paper. Do the same for the chocolate disc. Roll lightly over the layers so that the dough adhere. Remove the parchment paper on top. 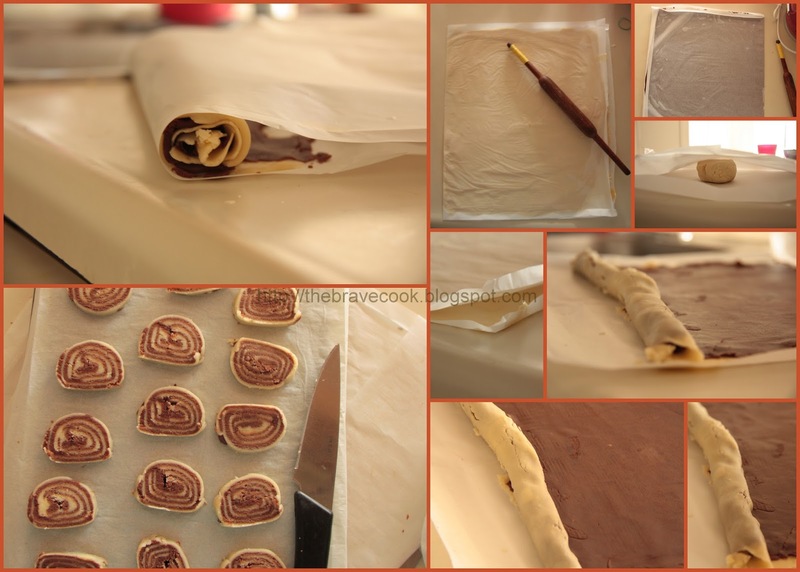 Wrap the log in parchment and refrigerate it for upto an hour. Carefully slice the log into ¼ inch thick cookies and place on a baking sheet 1 inch apart. Bake it for 10-12 minutes. The cookies are done when you see the edges turning golden brown. They also harden on the cooling rack. Cool it on wire rack.